No. 7 Nebraska (6-1) made short work of Iowa State (6-4) on Sunday afternoon to extend its winning streak to six. Scores in Nebraska’s favor were 25-22, 25-18, 25-16. The Huskers out-hit the Cyclones .257 to .137 and had five aces to eight errors compared to three aces and 10 errors for the Cyclones. Sophomore right side hitter Jazz Sweet put together her fourth straight spectacular performance with a match-high 11 kills on .500 hitting, and a lot of her work was done out of system. Maloney, the senior libero and co-captain, finished with a match-high 14 digs plus six assists and two aces. Senior outside hitter Mikaela Foecke had nine kills and seven digs. junior middle blocker Lauren Stivrins added eight kills on .462 hitting and freshman outside hitter Capri Davis chipped in eight kills. Freshman setter Nicklin Hames notched her fourth straight double-double with 29 assists and 13 digs. After forcing an Iowa State timeout just seven points in with a 5-2 lead, Nebraska got a little error-heavy and surrendered a 4-0 Cyclone run to give Iowa State a 9-8 lead. Nebraska used a timeout to regroup then reeled off a 5-1 run to pull ahead 15-12. Iowa State pulled within one at 17-16 but an Iowa State service error followed by an ace by Lauren Stivrins and a double-block by Callie Schwarzenbach and Hames gave the Huskers a 20-16 advantage. 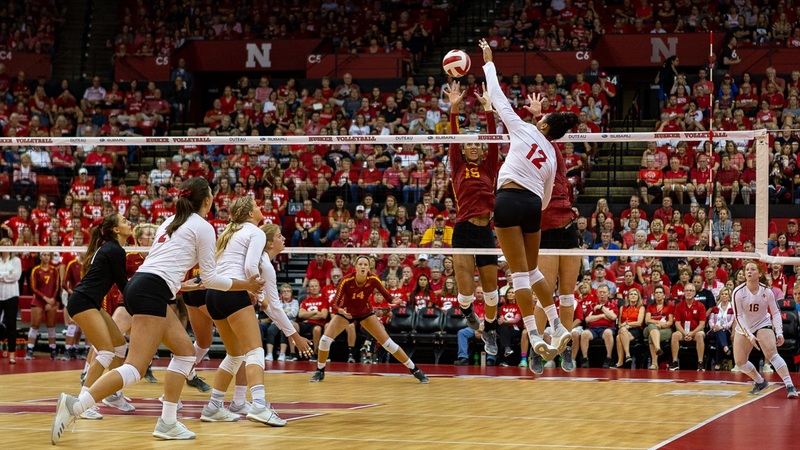 Iowa State countered with one last push to make it 22-21 Huskers but two straight Cyclone miscues gave Nebraska game point and Stivrins finished it off with a kill. Nebraska took the win despite narrowly losing the hitting battle .095 to .100. Iowa State took an early lead in set two, but a 7-0 run served by Foecke turned the tables and gave the Huskers a 16-10 lead. The Cyclones scored two in a row but Nebraska countered with three straight to pull ahead 20-12. Iowa State rallied again, cutting the deficit to four with back-to-back aces, but an errant serve snapped the run and Cook sent sophomore Anezka Szabo and senior Brooke Smith in for Hames and Hayley Densberger for blocking purposes to close out the set. Nebraska scored the last two points to take a 2-0 lead at the break. It was Smith’s first game action this season after winning her appeal to the NCAA for immediate eligibility on Friday. She was ruled ineligble shortly before the season-opener after transferring back to Nebraska following a year at Kansas State. Nebraska dominated from the start of the third set, using a 6-0 run with Megan Miller serving to take a 12-4 lead. Iowa State never threatened the rest of the way as the Huskers grew their lead to as much as 11 before cruising to the nine-point victory. The Huskers did not commit a single attack error in the third set, hitting .457. Nebraska will wrap up its nonconference slate with the Nebraska Invitational on Friday and Saturday. The Huskers will take on Central Michigan and New Mexico on Friday before wrapping things up against Missouri State on Saturday night.